The Iowa Association of Realtors has released its sales report for June and president Cindy Miller of Burlington says it’s a record breaker. IAR members sold 5,389 homes last month. That’s up 5.3-percent compared to June of 2016 (5,120 homes). 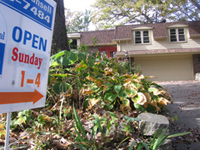 It’s also the most homes sold in Iowa over a one month period, according to IAR records. June and July are typically the busiest months for home sales in Iowa, but Miller says there are several factors that boosted sales a bit more than usual. The median sale price of a home in Iowa last month was $165,000 — up from $156,000 a year ago.